www.photomacrography.net :: View topic - Is this microscope good for starting microphotography? 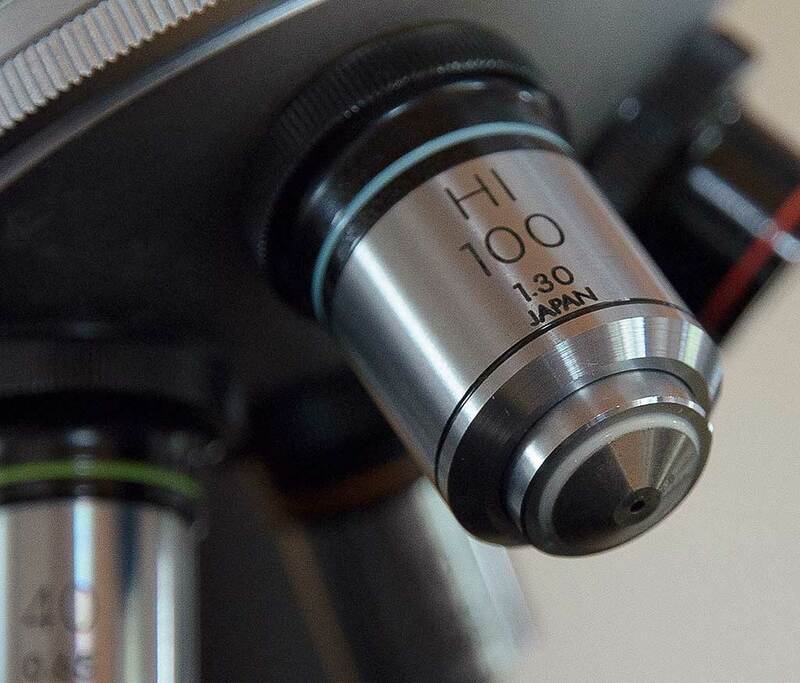 Is this microscope good for starting microphotography? Posted: Mon Apr 03, 2017 12:02 am Post subject: Is this microscope good for starting microphotography? I am very impressed with what you show on this platform. Being a macrofotographer for some years now, I would like to try some microscope photography. 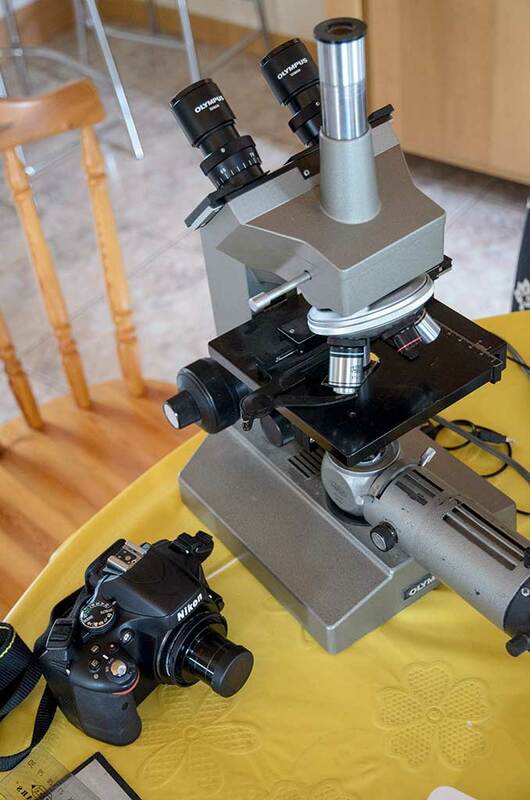 I find someone who wants to sell his Olympus-microscope for 200 euro's. (Two 10x-T/18L oculairs, WF 101 on the camera tube, HI 100, 40, 10, 10(0,25) , 4) Can anyone with experience give me advise on this matter ? I wonder if it would be difficult to connect my Nikon D5100 body, and should I need a certain lens that fits in the connectingtube ? This is an Olympus CH microscope http://www.alanwood.net/photography/olympus/downloads.html#ch with trinocular head and Koehler illumination light source. IF everything is in good condition, that's a good offer. The objectives are Olympus short barrel achromats; they are OK for starting work. 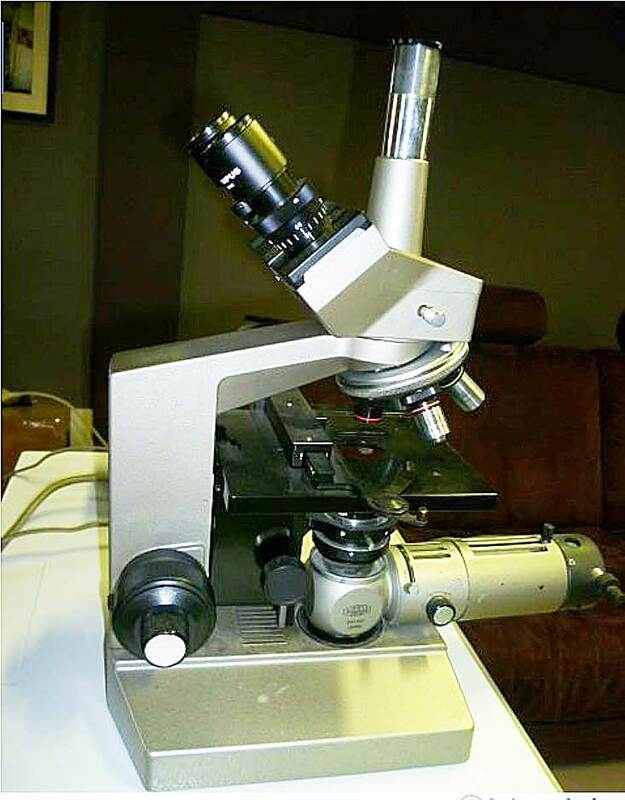 Later you might want to upgrade to plan objectives, for example the Olympus LB (long barrel) objectives, which should also fit on this microscope. This is something you should test; use an objective with 45 mm parfocal length (= LB) and see if the condenser and light source still fit underneath the stage. The Olympus 10x-T/18L oculars are actually part of the LB optical system. You can't mount the camera directly to your microscope because the Nikon DSLR has vibration isssues: http://www.photomacrography.net/forum/viewtopic.php?p=84940 You have to put an Olympus compensating eyepiece into the phototube and mount the Nikon camera above the phototube using a tripod or copy stand ("afocal adaptation"). Ususally, a widefield, compensating, high eyepoint eyepiece 10x is combined with a 40mm to 50 mm prime lens on your camera. You can also use long exposure or flash to reduce vibration. For example, use a right angle prism under condenser to direct flash up , while keeping some scope light for focusing. The objectives x10 and x 40 are very clear. Only the x100 is too soft. I think that it has to be cleaned, but it has such a small opening, I do not know how to clean this.....? Without an photo eyepiece, I could make some pictures, but they are not as sharp as what I see through the oculairs. So I searched equipment for connecting my Nikon D5100 APSC-body on this microscope with a phototube diameter 25 mm(more or less). But this is not very clear for me. I have a kind of lens adapter (see picture) to connect my camera on a telescope, and I hope I can use this also for connecting my microscope. And hope I can use the lens adapter I have. The 100x question is easy - it's an objective designed for Oil Immersion. If the 100x oil objective does not image well with oil and looks to have a dirty top lens, then it may have dry oil on its top lens. You can simply use a high concentration alcohol to wipe it off (most of the time, it will come off). If not, you may try acetone (less harsh) and Xylene (harsh). But only let acetone or xylene stay on lens for a few seconds, they may separate yours lenses if they stay too long. To be safe, ask Alan Wood what cleaning agent Olympus recommends for their oil objectives. You may use lens step-down (or step up) rings connection a photo eyepiece to your camera body (or camera lens), if you want a solid (not suspended/air gapped) connection. The eyepiece may have removable shells that you can remove to help connecting to lens rings and you may carefully use super glue. But I think it is best to separate camera from scope by air gap (support camera on copy stand of tripod). Only the x100 is too soft. I think that it has to be cleaned, but it has such a small opening, I do not know how to clean this.....? Be aware that it's an oil immersion objective, are you?. Without oil it will produce a very poor image, some models aren't unable to form an image at all. BTW you need to put a drop of an oil specifically oil intended for immersion microscopy. Leitz and Zeiss recommended either Xylene or 'petroleum ether'/isopropanol for cleaning. Both companies warned against using ethanol on their old (pre 1990s) optics (this should also apply to your Olympus objectives). Never use acetone, ether, etc. As for your camera, as I said, you can't attach it directly to your microscope (please see the references I linked). Unless all your exposures are > 1 second (unlikely?). That is the case for most Nikon DSLRs. So there is no use for adapter L and so on. Your camera needs to be mounted on a tripod or copy stand, without direct connection to the microscope. Projective: FK 2.5x is the one matching your Olympus objectives. Put it in the phototube and mount the camera with sensor about 150 mm above the projective. Protect the camera sensor by putting a camera UV filter across the front (e.g. Nikon-M42 adapter; 42-52 step-up adapter; 52 mm UV filter). Many users find the field of view with a projective 2.5x and APS-C sensor too small! Afocal: Olympus 10x compensating high eyepoint eyepiece + 50 mm prime lens! That's all you need. Take one of your 10x/18 eyepieces and put it in the phototube. Put a 50 mm prime lens on your Nikon and focus to infinity. Just hold your camera over the eyepiece and take some pictures, taking care that you don't scratch the front lens. Are the images any good? Thank you Pau, of course I didn't know that I had to use immersion oil, but I am learning. But to clean the front of that x100 objective, I do not understand how. The opening is not 1 mm in diameter, how can I reach the front of the lens ? Looking through an other oculair, I see that the front lens is covered with oil residus. So cleaning will be needed. Must I open it ? Or must I use a soft wooden toothstick (with Xylene or petroleum ether/isopropanol) and stick it through the frontopening trying to wipe the dryed oil off ? I wonder, is this also the case with this x100 1.30 objective, or is this only for objectives specially made for waterimmersion ? Must I open it ? It is very detailed. Please invest some time to read through it. It's worth doing so you don't do any permanent damage. No, in general, you cannot use oil objectives with water immersion, or water objectives with oil immersion. To clean dried oil residue, you don't have to stare at the top lens, just wipe its approximate location with the correct cleaning agent. This is very gentle, applies minimum pressure from the top and the thin film of xylene cannot run into the inside of the objective.